I am sitting comfortably in my chair taking a course on mindfulness and meditation. Like those around me, I want to cope better with stress and feel more relaxed. But more than that, I am intrigued by my fellow “students.” After all, an assisted living facility is hardly your usual meditation venue. Walkers and canes dot the room. Behind me is a woman in her 80s wearing a jaunty glittered cap. She is tethered to an oxygen tank that whooshes in and out. Our instructor is Bob Linscott from the Center for Mindfulness at the University of Massachusetts Medical School. He believes that mindfulness and meditation, often referred to as “mindfulness meditation,” can help adults in their 70s, 80s and beyond come to terms with the challenges of aging. A bit of background on the course: MBSR was created by world-renowned biologist Jon Kabat-Zinn, the founding director of UMass Medical School’s Center for Mindfulness and its Stress Reduction Clinic. MBSR is offered at more than 720 medical centers, clinics, and hospitals. Why? 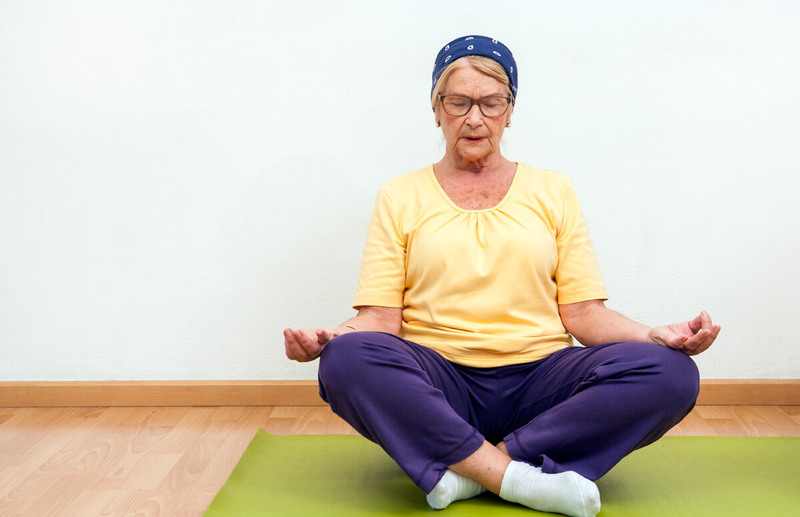 Research shows the profound psychological and physiological benefits of mindufulness meditation for seniors include reducing stress, depression, pain, and boosting emotional well-being. What are some of the issues around “mindful aging” that meditation helps? Everything! When people get older, they tend to ruminate: Am I going to run out of money? What will happen to me when I can’t stay in my home? Am I going to die alone? There’s worrying about how they will cope if their spouse dies first, thinking about a strained family relationship, or perhaps anxiety about burdening their kids with their care. Meditation is like a pause button that breaks the cycle of worry. It can help older adults better accept their changing bodies or chronic pain. It puts them more in control of their lives. When people meditate, the focus is on the present. Why is that significant? Older adults often live in the future with their fears or get caught up in the past. With mindfulness, you can catch yourself and think, “In this moment, I am okay.” Meditation quiets the mind and is very calming. That’s especially important because we live in a world that is so frantic and fractured by stimulus and technology, like smartphones. But there’s nothing that supports us to be quiet and still. So, meditation is a different way of dealing with stress? Yes! We used to think of stress as a life-threatening incident when the body has to prepare for fight or flight. But as we age, stress can also be ruminating and worrying. For younger people, day-to-day life is broken up by work, a spouse, or commuting. When you retire, you have all this extra time alone. It’s easy to get caught up in stressful thinking. Meditation teaches us to let go of that and work with negative thoughts and how we react to stress. We learn new patterns of responding and that’s where we begin to see transformation. It’s harder for older people because they’ve spent their entire lives with these patterns. Meditation helps them slow down and take a minute to react. But along with that, it also teaches us to be kinder to, and less critical of, ourselves. What I’m hoping is that when people start rehashing some of their worries and criticisms, they will catch themselves and remember to be less judgmental. How are you seeing meditation’s impact in your classes? How does meditation work when you have mobility issues? The reality is that as we age, we may have issues with balance, strength, and agility. But with mindfulness meditation, you can do it all sitting in a chair regardless of mobility or ability. You can also do it anytime and anywhere — walking, standing in line with a walker or cane, lying down, or sitting. At Bethesda, we’re committed to the health of our senior residents. Our senior living communities across the St. Louis area offer an activities calendar for seniors of all abilities. Schedule a tour at a community near you to learn more. Find more Senior Health & Wellness Tips on Bethesda’s blog. By Sally Abrahms for Next Avenue.